Circuit training moves you from one strength exercise to another without stopping, providing you with a high-intensity fat-burning workout. Traditional circuit classes usually take place inside using weights. However, moving your circuit routine outside can give it a fresh twist. 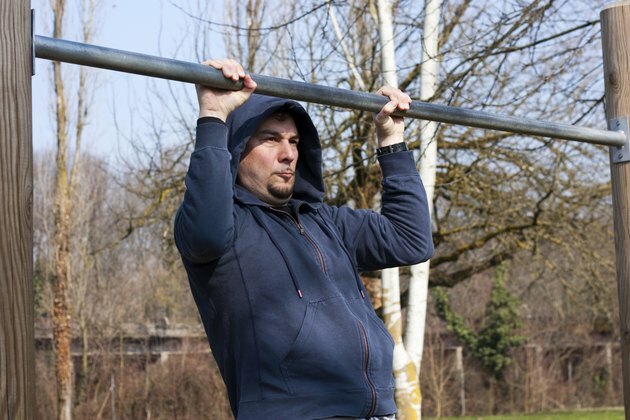 The park, the beach, the ski-slopes or even your own backyard can be used for circuit training. The idea is to take fun outdoor activities and combine them into sequential moves for 30 to 45 minutes. Take your circuit training outside next time for a fun workout that can burn up to 510 calories, according to "Fitness Magazine". Park circuit workout is a fun, high-intensity workout that uses the outdoors instead of free weights. This equipment-free workout uses your body weight and gravity. Begin this workout with a five-minute warmup, such as a brisk walk. The first circuit is the power pledge, which is a one-arm pushup on a park bench and moves into a tree plank, a plank with your feet on the tree. The park bench is used for the next three moves--the rond de jambe, the hot seat and the toe tap. Do two sets of 10 to 12 repetitions of all moves with little rest between sets. This circuit workout varies from traditional styles because it does not use any strength training. Outdoor walking circuit training strolls you through your favorite park, trail or beach with circuits of different walking styles. The key to this workout is to have fun and be creative. Use flat surfaces, curbs, sand and dirt for different levels of intensity and change the tempo and direction of your stride every two to three minutes. Try walking backward, shuffling sideways, skipping and cross stepping to create your own workout. High-intensity interval training, often referred to as HIIT, is organized cardiovascular training that combines short duration, high-intensity exercises with low-intensity intervals of active recovery. Using a scale of 1 being the lowest and 10 being the highest, your high-intensity segments should be over 7. A HIIT session begins with a five- to 10-minute warmup, which gradually increases in intensity. Running and cycling are both excellent exercises to use for HIIT. Intervals should be one minute of high-intensity activity with two or three minutes of low-intensity recovery. Fitness: How Many Calories Are You Really Burning? ACE Fitness: What is High Intensity Interval Training, HIIT, and What Are The Benefits?